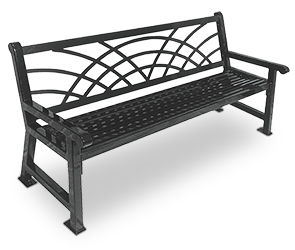 The artistically designed Savannah Collection bench adds	an elegant flare to garden spaces, streetscapes and many commercial settings. Crafted from steel tube the creative back rest design provides eye catching details, inviting people to sit, relax and enjoy. Constructed entirely with 2" x 2" square steel tubing, the Savannah Collection bench is engineered for durability. Finished in a highly impact and weather resistant, UV stabilized polyethylene finish, this 4' or 6' bench will continue to look new throughout the years.